BURLAND, JEFFREY HALE, businessman, militia officer, and philanthropist; b. 19 March 1861 in Montreal, son of George Bull Burland and Clarissa Healy Cochrane; m. there 17 June 1896 Isabel May Megarry; they had no children; d. 9 Oct. 1914 in London, England, and was buried in Mount Royal Cemetery, Montreal. After attending the Montreal Academical Institution, Jeffrey Burland entered the faculty of applied science at McGill College in 1878. Specializing in practical chemistry, he graduated in 1882 with a bsc, fully prepared, according to the college’s calendar, for a life in the “higher forms of Manufacturing Art.” He would maintain his interest in science in later life as a fellow of such British organizations as the Chemical Society, the Society of Chemical Industry, the Royal Geographical Society, and the British Association for the Advancement of Science, and as a fellow representing the faculty of applied science in the corporation of McGill College. Following graduation, he began work in his father’s firm, the British American Bank Note Company of Montreal and Ottawa. He remained with the firm throughout his life, becoming president in 1907 on his father’s death. The firm printed banknotes, stock certificates, and bonds as well as postage and revenue stamps, and it was noted for the quality of its work. 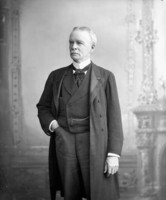 As a prominent businessman, Burland was president or chairman of a number of companies, including the Consolidated Lithographing and Manufacturing Company, Prudential Trust Company Limited, Dominion Trust Company, Mount Royal Spinning Company Limited, Central Canada Manufacturers Fire Insurance Company, and Noiseless Typewriter Company. 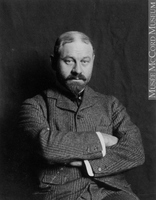 Not only a successful businessman – he was rated a millionaire by the Montreal Daily Star – he was also respected by his peers, being elected president of the Montreal Board of Trade in 1911 and serving as its delegate to international congresses in 1910 and 1912 as well as its permanent representative on the British Imperial Council of Commerce. Burland was deeply involved in the reform currents of his time. His interest in public health was expressed in his life governorships of the Montreal General Hospital, the Protestant Hospital for the Insane, and the Western Hospital of Montreal. His desire for urban reform led to participation in the founding of one of the first milk dispensaries in Montreal and to his serving as director of the National Housing Association in 1914. As a “progressive,” he was a tireless promoter of the metric system, not only as a member of the Decimal Association of London, but also as the publisher of a chart of the metric system. His career as a philanthropist received a considerable boost when he inherited his father’s fortune, estimated at several million dollars. His friend Henry Dalby, a newspaper editor, asked him, “What are you going to do with all that money?” According to Dalby, Burland replied, “My intention is to do some good with it.” Two charitable works in particular benefited from his philanthropy. The first was the Royal Edward Institute, established for the study, cure, and prevention of tuberculosis, which opened in 1909 in a building provided by Burland and his sisters. At the opening, the convergence of his scientific interest in technology and his philanthropic concern found its most symbolic expression. Harnessing the possibilities of electricity, Burland arranged for King Edward VII to press a key in England which, by transatlantic cable, automatically opened the doors of the new institute and silenced a crowd of onlookers. The Royal Edward Institute was the culmination of his family’s lengthy involvement in the fight against tuberculosis. His father, George, had entered the fray in November 1902 as a founding member of the Montreal League for the Prevention of Tuberculosis. Two years later he provided offices for the first tuberculosis dispensary in Montreal. In 1905 Jeffrey became a member of the dispensary’s board of directors. He was more than a figurehead, participating in one of the first attempts organized by the league to gather statistics on the extent of the disease in Montreal. Later, in 1909, the league became affiliated with the Royal Edward Institute. After the institute’s first president, Sir George Alexander Drummond*, died in 1910, Burland succeeded him. The second major charity to which Burland devoted much attention was the Canadian Red Cross Society, of which he was provincial organizer in 1912. Two years later, on 25 September, he was appointed its Canadian commissioner in London. He travelled to England to take up duties there, but died shortly after arriving. Burland had also maintained a strong involvement in the militia, obtaining a commission in the 6th Battalion of Infantry (Fusiliers) in 1882. Ten years later he commanded the regiment. He retired in 1908 with the rank of honorary lieutenant-colonel of the 1st Regiment (Prince of Wales’s Fusiliers). In 1897 he had been president of the Montreal Military Institute. As a result of his interest in small arms, he served as president of the Amalgamated Rifle Association in 1895 and as commandant of the Canadian rifle team when it won the McKinnon Challenge Cup at Bisley, Surrey, England, in 1902. From 1911 to 1913 he presided over the Dominion Rifle Association and he had held office in local, provincial, and federal rifle associations. He was also prominent in the Boy Scout movement, serving as provincial commissioner from 1910 to 1914. Jeffrey Burland was at once a deeply conservative product of his times and someone who sought change and reform. If one were to search for a common thread that linked his many activities in the worlds of business, charity, and the military, it would probably be a well-developed taste for precision and control. ANQ-M, CE1-132, 10 juin 1861. Gazette (Montreal), 18 June 1896. Montreal Daily Star, 9, 24 Oct, 1914. Canadian men and women of the time (Morgan; 1898 and 1912). H. E. MacDermot, A short history of the Royal Edward Institute (Montreal, 1965). McGill Univ., Annual calendar (Montreal), 1882. Claudine Pierre-Deschênes, “La tuberculose au Québec au début du XXe siècle: problème social et réponse réformiste” (thèse de ma, univ. du Québec à Montréal, 1980). Standard dict. of Canadian biog. (Roberts and Tunnell). G. J. Wherrett, The miracle of the empty beds: a history of tuberculosis in Canada (Toronto, 1977). Peter Keating, “BURLAND, JEFFREY HALE,” in Dictionary of Canadian Biography, vol. 14, University of Toronto/Université Laval, 2003–, accessed April 24, 2019, http://www.biographi.ca/en/bio/burland_jeffrey_hale_14E.html.